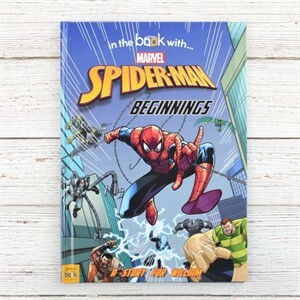 With this Personalized Spiderman Beginnings Book, your child joins Spiderman in this Marvel adventure. This storybook goes back to Peter Parker's origins, showing how he became the famous Marvel superhero that he is known as. Spiderman has fought villains and criminals of all sizes and shapes! Fans of the Marvel Spiderman movies and Spiderman comics alike are sure to get a kick out of this storybook. This Spiderman picture book will include your loved one's name throughout the text, as well as a personal message to them on the first page! Gift boxes are also available to purchase with this item. Availability: This Personalized Spiderman Beginnings Book takes approximately 4-5 business days to leave the warehouse plus transit time.